KEY WEST, Fla. - Robert D. Barbagli, 41, of 11 Hutchinson Lane, died Thursday [1/16/89] at the Florida Keys Memorial Hospital in Key West, after a brief illness. 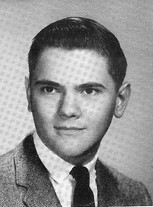 Born January 25, 1947, son of Lee and Minnie DeSarno Barbagli of 15 Forest Ave., Meriden Conn., he was a 1965 graduate of Platt High School in Meriden and a graduate of Franklin and Marshall College in Lancaster, Pa. He wa a certified public account for the city of Key West. Besides his parnets, he is survived by a son, ,Christofer Barbagli, and a daaugher, Kara Barbabli, both of Pelham, N.Y.; a sister, Murna Barbagli, of Meriden; and several aunts, uncles, and cousins. The funeral was held Saturday at the Lopez Funeral Home, 418 Simonton Ave. Burial will be private and held at a later date, at the convenience of the family.